On An Overgrown Path: How about an experimental plugged-in Prom? How about an experimental plugged-in Prom? Alex Ross' typically astute chronicle of his visits to the Elbphilharmonie and Pierre Boulez Saal is notable for two particular reasons. The first is that Alex professes to finding the sound in the Elbphilharmonie "a mild disappointment". This view contradicts the acclaim elsewhere for - and I quote - "the world’s first 'acoustically perfect' concert hall", but concurs with the opinion expressed to me privately by a musician whose ears, like Alex's, I trust implicitly. The Elbphilharmonie is undoubtedly an architectural miracle, but there is also some informed feedback that 10,000 unique acoustic panels do not guarantee sonic perfection. The second striking point about Alex's article is its headline 'Germany's new concert temples'. Now temples are places where rituals of worship are enacted, and those rituals are often arcane and rooted in antiquity. One viewpoint is that the Elbphilharmonie and Pierre Boulez Saal are state-of-the-art classical music venues; but another is that they are places where arcane musical rituals rooted in antiquity are enacted. And in view of the continuing preoccupation with finding a new young classical music audience, the second viewpoint should at least be explored. My header photo* shows a typical recital of Indian classical music. Evident in the photo and evident in virtually every contemporary recital of Indian music are the microphones for amplification. Instruments such as the sitar produce a beautiful sound, but one that is limited in volume. To adapt to larger venues and also to adapt to young ears conditioned by louder popular music, the Indian classical tradition accepted amplification as a sine qua non years ago. Now here is the important point: not only did amplification not drive away the core audience, but Indian musician friends tell me that their classical tradition - unlike its Western equivalent - is undergoing something of a revival with young audiences. Western classical music has always come down heavily on the 'listener to music' side in the 'music to listener' or 'listener to music' debate. Which means making token concessions such as applause between movements and dispensing with formal attire. But it also means 'pure concert hall sound' is absolutely non-negotiable, despite concert hall sound being an entirely artificial historical construct. As explained in a 2015 post, the pure sound of an orchestra is what we would hear if it played in an anechoic chamber. An anechoic chamber is an acoustically dead space, and anyone who has spent time in one - as I have in the now demolished EMI Research anechoic chamber at Hayes - will know that the thin, dry and dead sound would be unacceptable to any audience, purist or otherwise. The sound of an orchestra in iconic concert halls such as the the Concertguebouw in Amsterdam and the Musikverein in Vienna is determined by the acoustic of the hall; the acoustic is the unique character that is added as the sound reverberates. These halls date from the late-19th century and their signature sound - which remains the reference for concert halls - was subjectively optimised for the bass-lite pre-Romantic orchestra. If classical music wants a new younger audience it must accept that its target listeners like their music loud and visceral. But the convergence of 2000+ audience capacity halls - the Elbphilharmonie seats 2100 - and leaner more musicologically-informed performance styles means today's listening experience is often visceral-lite, particularly in the cheaper seats favoured by classical music newbies. As explained in another earlier post, if a listener is played the same piece of music twice on identical replay equipment at two different levels (volumes), he/she will judge the louder of the two auditions to be “better” quality. 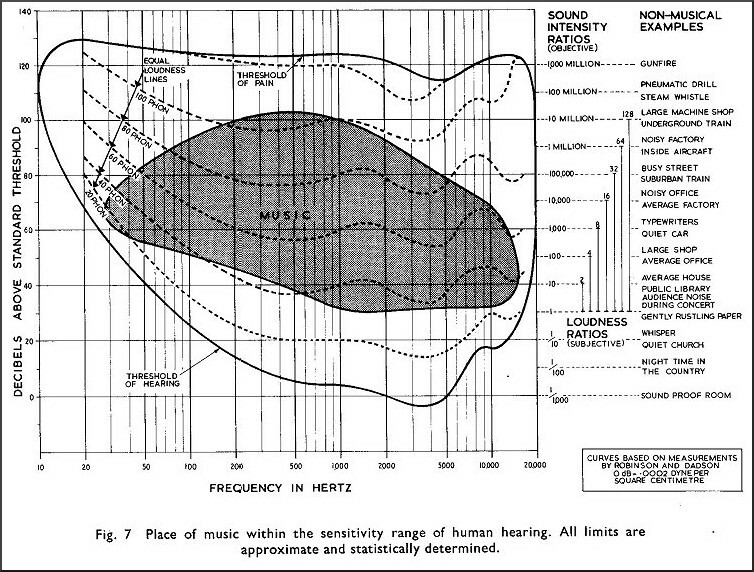 The explanation lies in the non-linear frequency response of the human ear which is plotted on the diagram above (source J.Crabbe Hi Fi in the Home). The curved shape of the lower line in the diagram marked ‘Threshold of hearing’ shows how the replay level increases as the range of the human ear increases. This means that extreme highs and lows become audible, giving the music more impact and makes it sound “better” - particularly to a new and uninitiated audience. Back in 2010 Jonathan Harvey - another person whose ears I was happy to defer to - caused considerable controversy by opining that "The future must bring things which are considered blasphemous like amplifying classical music... nobody should be deprived of classical music, least of all by silly conventions". It was unfortunate that Jonathan turned the spotlight on the very specific solution of amplification, rather than on the problem of relative loudness. However, seven years later classical music remains in denial that the 19th century convention of 'concert hall sound' may be a significant obstacle to attracting a new younger audience. I am not suggesting stacking bass bins on the Elbphilharmonie platform. But I am suggesting that it is time for the music to meet the listener at some mid-point using the latest digital sound-shaping technologies. Just one example of how this could be done is by experimenting sparingly in the concert hall - a one-off 'plugged-in' Prom perhaps? - with the latest non-intrusive tools such as Meyer Sound's Constellation variable acoustic technology used in the highly-acclaimed San Francisco Symphony Soundbox performance space. Giving the new young audience what they actually want in the form of a more involving sonic experience, may well prove more productive than the tired old chestnuts such as classical gigs in pubs that are still doing the rounds after so many years. 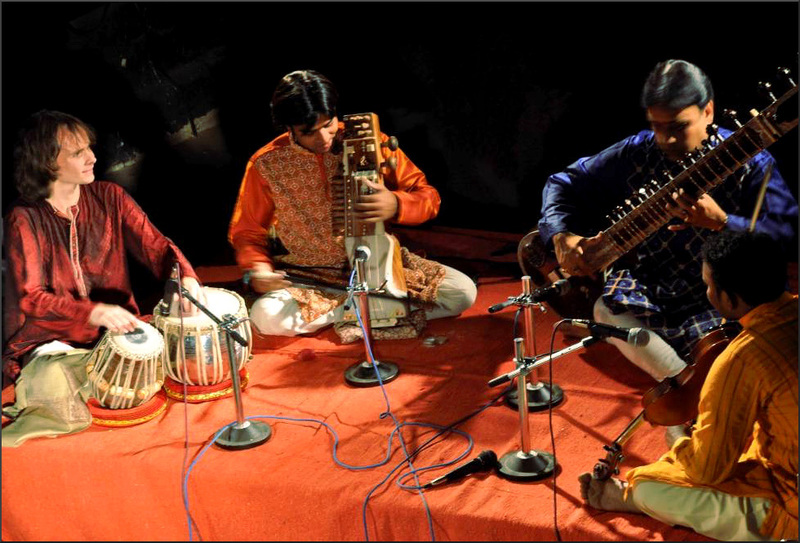 * Photo shows Florian Schiertz (tabla), Mohammed Aslam Khan (sarangi), Pandurang Mutalik (sitar) and Shankar (violin) playing at the Hyderabad Western Music Foundation. Any copyrighted material is included as "fair use" for critical analysis only, and will be removed at the request of copyright owner(s). Also on Facebook and Twitter. Forgive my lack of knowledge but I seem to recall Humphrey Burton explaining that, when he was at the Hollywood Bowl, selective amplification was what they did. What's food for the Humphrey.. The 19th century concert halls actually look like Greek and Roman temples. Birmingham Town Hall, built in the 1830s and home to the CBSO until the 1990s, was apparently modelled on the temple of Castor & Pollux in the Roman forum. Is the classical music scene still stuck in the 19th Century cult of Art as a substitute for religion and the Artist as prophet or priest? Oh dear I think you have been taken in by the spin regarding the Soundbox in San Francisco. Meyer Sound did a super job yes, of turning an INAPPROPRIATE SPACE for musical performance into A BARELY ACCEPTABLE ONE! I have been to a couple of performances there. One was great the other not so great, but that had a great deal more to do with the performers and the music than either the space or the vibe. I live in San Francisco and we are blessed with three appalling spaces for the three main categories of classical music performance. An opera house and chamber music venue, built in the 1930's that are sound suckingly huge (capacities, well over 3,000 and about 1,000) and a symphony hall with a capacity of about 2,700 that was built on a square lot resulting in a square concert hall that even Meyer Sound couldn't rescue. Appalling sound! I have not yet been to the Elbe Philharmonie (capacity 2,100) or the new hall in Paris (capacity 2,400) but I have been to the Disney Hall in Los Angeles (capacity 2,200) and the sound there was OK just like the sound in the Festival Hall in London (capacity 2,500) is OK. However I recently attended a concerts in the Vienna Konzerthaus (capacity 1,800) and the Vienna Volksoper (capacity 1,300) and the Wigmore Hall (capacity 550). There is just no comparison between the excellence of the experience in these three halls compared to the huge halls with their vast capacity that greed has created. So, I have come up with a plan! From now on when a new concert hall is planned and superstar architects are hired their brief is to COPY THE KONZERTHAUS, THE VOLKSOPER and THE WIGMORE HALL. EXACTLY! We will agree to pay them the same fee that they would earn presenting us with rubbish, but they have to copy one of the great halls. So, what do you think? Will Nouvel, Gehry, Herzog and De Meuron, Schwartz, etc. etc. go along with the idea?